After Mexico, Moscow and Mykonos, Beefbar continues to conquer the world and is lately getting settled in the heart of Hong Kong (late October). It is again the Monaco-based architects Humbert & Poyet that designed the site. 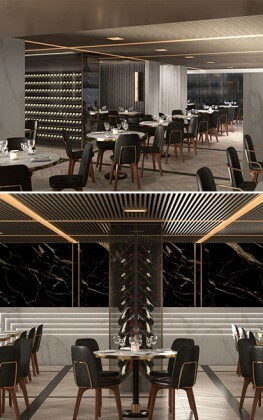 Clean lines, quality materials, cozy and trendy atmosphere … the restaurant offers a timeless luxury that differentiates it from other meat restaurants. Warm colors are combined with refined and raw elements such as leather, white marble, copper …. The famous marble Raw Bar where carpaccios, “tartares” and tiraditos are prepared on the spot in front of customers is of course the centerpiece of the place. Not to mention the bar and the intimate terrace, perfect to relax and take refuge away from the frenzy of Hong Kong. The Chef Andrea Spagoni, implements a unique dining experience: we find an impressive list of high quality meat and from different origins: hormone-free USA Black Angus, certified Japanese Kobe beef, Australian Black Angus… sublimate the product, a revolutionary cooking technique is used and we like to accompany the different versions with potato puree. Finally, the dessert: cherry and pistachio soufflé, chocolate cake with pear and Sansho ice-cream to delight the most jaded palate! Beefbar: a gastronomic experience for discerning carnivores! A. F.-M.
Air Mauritius : Hurry its not too late!